We want to take a chance on more democracy. 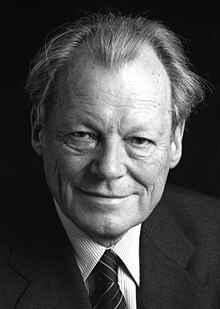 Willy Brandt (18 December 1913 – 8 October 1992) was a German politician and Chancellor of Germany from 22 October 1969 to 16 May 1974. In 1971, he was awarded the Nobel Peace Prize for his efforts to reconcile with the Eastern Bloc states. What belongs together, is growing together again. Auch wenn zwei Staaten in Deutschland existieren, sind sie doch füreinander nicht Ausland; ihre Beziehungen zueinander können nur von besonderer Art sein. Even though two states in Germany exist, they are not foreign countries to each other—their relations with each other can only be of a special kind. government policy statement on 28 October 1969, p. 2, bwbs.de (PDF file). We are not chosen by God, but by the voters—therefore we seek dialogue with all those who put effort into this democracy. government policy statement on 28 October 1969, p. 19, bwbs.de (PDF file). government policy statement on 28 October 1969, p. 1, bwbs.de (PDF file). Those who adhere to the past won't be able to cope with the future. speech at the extraordinary convention of the Social Democratic Party of Germany on 18 November 1971, book source: "Reden und Interviews: Herbst 1971 bis Frühjahr 1973", Hoffmann und Campe, 1973, p. 25. In our modern world, mass hunger, economic stagnation, environmental catastrophe, political instability, and terrorism cannot be quarantined within national borders. Attributed in "World Government—What Are the Obstacles? ", Awake! magazine article, 1984, 12/22. A number of poor countries are threatened with the irreversible destruction of their ecological systems while many more face growing food deficits and possibly mass starvation. In the international economy there is the possibility of... a collapse of credit with defaults by major debtors, or bank failures... [and] an intensified struggle for influence or control over resources leading to military conflicts. Attributed in "Are We Nearing Armageddon? ", article on The Watchtower magazine, 1980, 10/15. This page was last edited on 9 December 2018, at 11:38.